Heat the schmaltz in a small skillet. Add the liver and onions and cook until the liver is cooked through and the onions are starting to look a bit black around the edges and are very soft and translucent everywhere else. Allow to cool to close to room temperature. Scrape everything from the pan onto a cutting board. Chop the liver, onions and egg until into fine crumbs that start to stick together (thanks to the schmaltz), about 5-10 minutes. Add more schmaltz or olive oil to bind if it is very dry. Stir in salt and pepper. Refrigerate 1 hour prior to serving for best flavor. *To render chicken fat to make schmaltz: Heat a sauté pan, add the fat, and the small onion, quartered and cook over medium heat until the fat is rendered. Strain into a heat safe bowl or measuring cup. Or use olive oil. Growing up my dad would say "what am I chopped liver?" whenever he felt he was being overlooked for something; implying that chopped liver was something no one wanted. Matt on the other hand, grew up eating chopped liver and it was quite an enjoyable thing indeed. Now that we are married, we make chopped liver and it is tasty! We like coarser texture like the one Matt's grandmother made so we do it all by hand versus using a grinder or food processor. Smoother textured chopped liver is okay but not our favorite! We have given chopped liver a lot of thought, possibly more than anyone else has to such a simple dish. We've had chopped liver at delis that is slightly sweet which we didn't particularly like and found puzzling until I figured out I bet they add wine (a common variation or cognac) and since the delis are kosher, I'm sure they were using kosher wine which can be quite sweet. 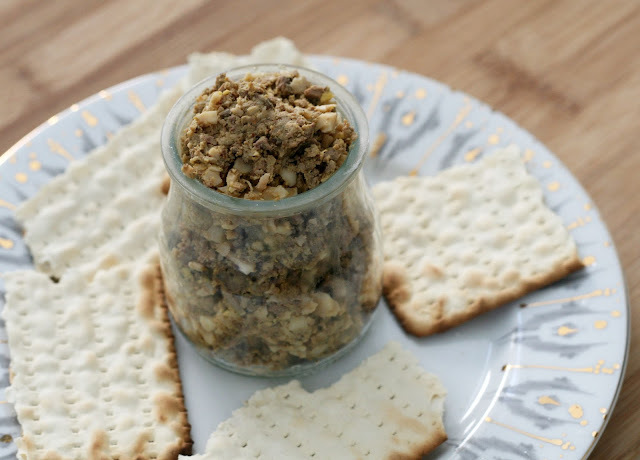 This is not a sweet or smooth chopped liver but it is delicious and perfect for smearing on a bit of onion and egg matzo.